Naburn, Yorks., g. 733 (35). Nackington (Natyngdon), Kent, p. 566. Nafferton (Naffreton), Yorks., p. 566. Nagden (Negdon) Marsh, Kent, g. 436 (44). Nanfan, Sir Ric., deputy of Calais (temp. Hen. VII.) 729. Nantes, in France, 704 (p. 329). Nanteuil le Haudouin, in France, 124n. Naples harness, 853 (p. 426). Naples, kingdom of, 104, 462 (p. 192), 582, 670 (2), 712, 808. -, viceroy of. See Toledo, Pedro de. Napoli di Malvasia (Malveseta), in the Morea, 104, 778, 794, 808. Napoli di Romagna (Romulia, Naples di Romania), in the Morea, 104, 448, 582, 778, 794, 808. -, vicar of. See Shorthwayte, W.
Narrow Water, co. Down, alias Port O'Neil, 6834. Nash (Nasshe), co. Glamorgan, p. 562. Nash (Nasshe), Wm., g. 613 (37). Nassau, Henry count of, marquis of Zenete (died in Sept. 1538), father of the Prince of Orange, 876. Nasshe mill, in Abbots Langley, Herts, g. 733 (53). Nassington, Ntht., g. 144 (2). Natton, Wilts, g. 942 (110). Naunton, Wm., Suffolk's treasurer, 190. -, Wm., g. 942 (44). Navarre, kingdom of, 40, 320, 332, 457 (p. 189), 508 (p. 227), 543 (pp. 2445). Navarre, Henri d'Albret king of (Mons. de Labrit), an exile in France, 457 (p. 189), 508 (p. 227), 543 (pp. 2445), 597, 810, 838, 842, 870, 87980, 890, 905, 932, 949, 981. -, -, his daughter. See Albret, Jeanne d'. Navarre, Queen of. See Margaret of Angoulme. Navy. See Ships, the King's. Naylor, John, g. 942 (61). Neachley (Nechlees), near Tong, Salop, g. 611 (26). Neapolis or Neapolitane, bp. of. See Draper J.
Neasham (Nesam, Neshame) nunnery (supp. ), D'ham, 305. -, pension list, p. 552. -, prioress. See Lawson, J.
Neath (Nethe Burgus, Neth), co. Glam., g. 613 (5). -, abbey (supp. ), of, pp. 5612, 564. Nedeham (Nedham), James, clerk and surveyor of the King's works, 1029 (10). -, Sir Robt., 354:g. 282 (7). -, -, letter from, 354. Needham (Nedehame) Market, Suff., p. 564. Neele, John, g. 611 (14). Neile (Neyle), Barbara, p. 543. Nelysfen, Norf., g. 942 (18). Nete, Thos., 608 (3, 4 iii.). Netherbury, Dors., prebend in Salisbury, g. 942 (114). Netherclyff, Thos., g. 436 (34). Nethersall, Robt., 609 (p. 275). Netley (Leteley) abbey (supp. ), Hants, 556. Nettlestead (Nettylsted), Suff., letters dated at, 225, 286. Neuburg, in Germany, letter dated at, 854. Neubourg or Neufbourg (Naufbourg), in Normandy, 651, 949. -, letters dated at, 572, 903. Neuchatel (Neocomi), in Switzerland, letter dated at, 534. Neudyke, Kath., prioress of Wykeham, p. 553. Neuenaar (Nuenare), earl of, comes in the train of Anne of Cleves, 14 (2). Neuenaar (de Nova Aquila), Wm. a, sent from Granvelle to the Protestants, 589, 666 (p. 316). Neufchastel, in France, letter dated at, 700. Nevendon (Newenden), Essex, g. 282 (40, 76), 611 (8, p. 285). Nevenson (Neyvynson), Chr., a member of Convocation, signature of, 861. Nevers, duchess of (Marg. de Bourbon, daughter of Charles duke of Vendome, wife of Francis duke of Nevers), 740. Nevers, Francis Duke of, 115. Nevers, Louis de Cleves, mons. de (not the Duke), 222, 253. Nevers, count Gui de, 597 (2). -, count Loys de, 597 (2). Nevill, lord, 14 (p. 5). Nevill (Nevell), (qu. Ric. N., Cranmer's servant? ), 1029 (63). -, (Nevell), Ant., g. 282 (4). -, (Nevell). Sir Edw., uncle of Henry lord Montague (executed 9 Dec. 1538), 686, 939 (p. 465);g. 942 (25, 36). -, (Nevylle), Isabel, p. 543. 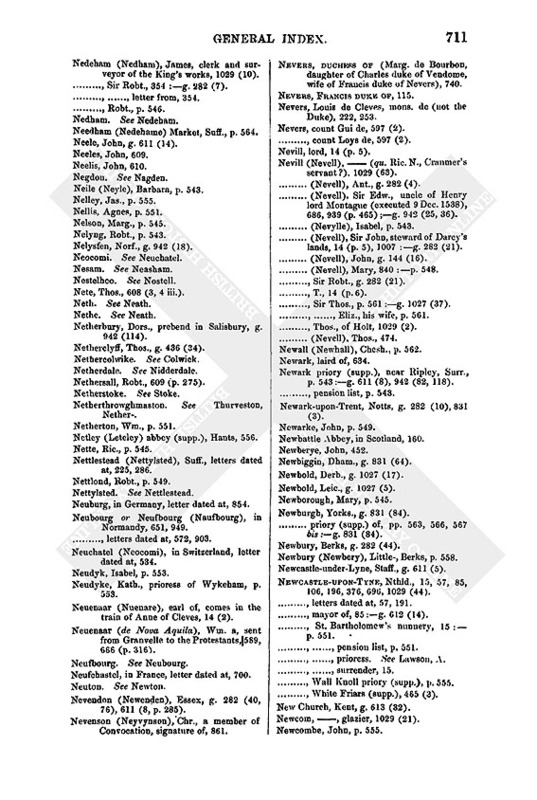 -, (Nevell), Sir John, steward of Darcy's lands, 14 (p. 5), 1007:g. 282 (21). -, (Nevell), John, g. 144 (16). -, (Nevell), Mary, 840:p. 548. -, Sir Robt., g. 282 (21). -, T., 14 (p. 6). -, Sir Thos., p. 561:g. 1027 (37). -, -, Eliz., his wife, p. 561. -, Thos., of Holt, 1029 (2). Newall (Newhall), Chesh., p. 562. Newark priory (supp. ), near Ripley, Surr., p. 543:g. 611 (8), 942 (82, 118). -, pension list, p. 543. Newark-upon-Trent, Notts, g. 282 (10), 831 (3). Newbattle Abbey, in Scotland, 160. Newbiggin, Dham., g. 831 (64). Newbold, Derb., g. 1027 (17). Newbold, Leic., g. 1027 (5). Newburgh, Yorks., g. 831 (84). -, priory (supp.) of, pp. 563, 566, 567 bis:g. 831 (84). Newbury, Berks, g. 282 (44). 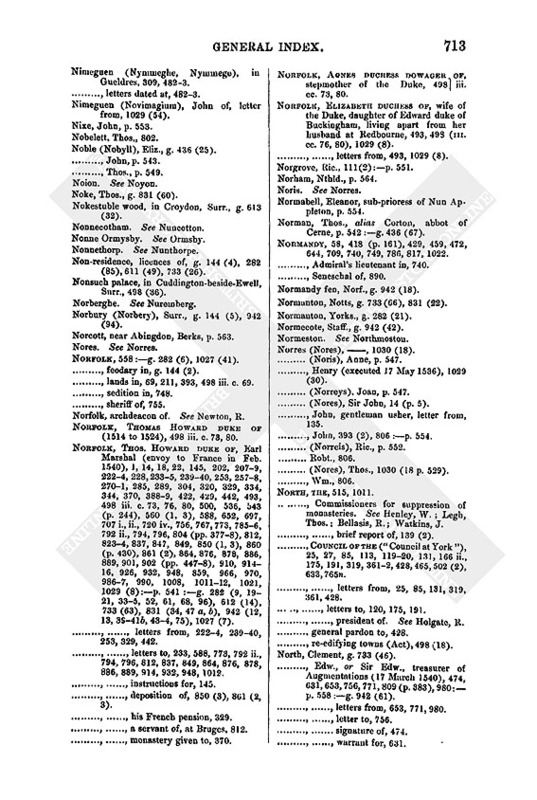 Newbury (Newbery), Little-, Berks, p. 558. Newcastle-under-Lyne, Staff., g. 611 (5). Newcastle-upon-Tyne, Nthld., 15, 57, 85, 106, 196, 376, 696, 1029 (44). -, letters dated at, 57, 191. -, mayor of, 85:g. 612 (14). -, St. Bartholomew's nunnery, 15:p. 551. -, -, pension list, p. 551. -, -, prioress. See Lawson, A. -, Wall Knoll priory (supp. ), p. 555. -, White Friars (supp. ), 465 (3). New Church, Kent, g. 613 (32). Newcom, , glazier, 1029 (21). Newdigate, J., 14 (p. 6). -, John, g. 831 (47b). -, Sibilla, prioress of Holywell, p. 545. Newenden, Kent, g. 613 (32). Newenham (or Newnham) Court, Kent, g. 942 (49). -, Sir Wm., 14 (p. 5). Newhall, Herts, g. 733 (57). Newhall Josselyn, Essex, g. 613 (38). Newham or Newenham abbey (supp. ), Devon, near Axminster, p. 545:g. 733 (17). -, abbot of. See Gill, Ric. -, pension list, p. 545. Newington, Kent, g. 942 (49). Newland, East- (Estnewlande), Essex, g. 611 (8). -, Joan, 1006 (p. 499), 1011. -, John, pp. 545, 549. -, Thos., g. 943 (18). Newmarket, Camb., 442:g. 942 (19). Newminster abbey (supp. ), Nthld., beside Morpeth, p. 541. Newnham (Newneham), Herts, g. 733 (42). Newnham (Newenham, Newnehame) priory, near Bedford, 11:p. 549:g. 436 (9, 42). -, pension list, 11:p. 549. -, prior. 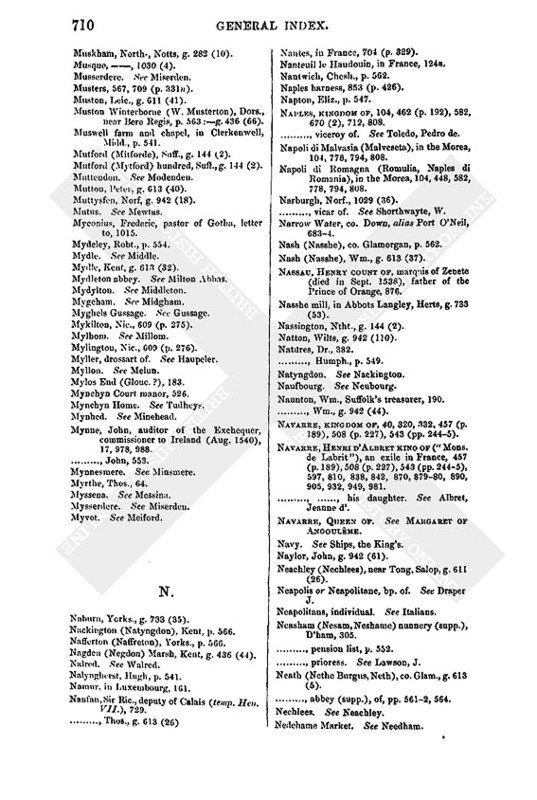 See Burne, J.
Newneham or Newnhame, John, 81:p. 551. Newport, co. Pembroke, g. 282 (74). Newport, Salop, g. 733 (51). Newporte, John, g. 282 (61). -, Thos., 49, 498 iii. c. 75:p. 553:g. 282 (7), 942 (106). Newsham (Newsome) abbey (supp. ), in Brocklesby, Linc., g. 831 (23). Newstead (Newsted), Linc., beside Stamford, g. 612 (15). -, priory (supp.) of, g. 612 (15). -, -, priory of. See Blakett, J.
Newstead (Newstede) priory (supp. ), Notts, in Sherwood Forest, p. 546:g. 733 (66). -, pension list, p. 546. -, prior. See Blake, J.
Newstede, Staff., g. 611 (5). Newtimber (Newe Tymbre), Suss., 806. Newton hundred, Dors., g. 942 (62). Newton St. Loe, Soms., 689. Newton next Ellesmere, Salop, g. 611 (26). Newton, Long- (Langenewton), Dham., g. 831 (64). -, Sir John, 14 (p. 6):g. 282 (9), 942 (13). -, (Neuton), Marg., p. 543. -, Robt., archd. of Norfolk, 861. -, Wm., 609 (p. 276):p. 551. 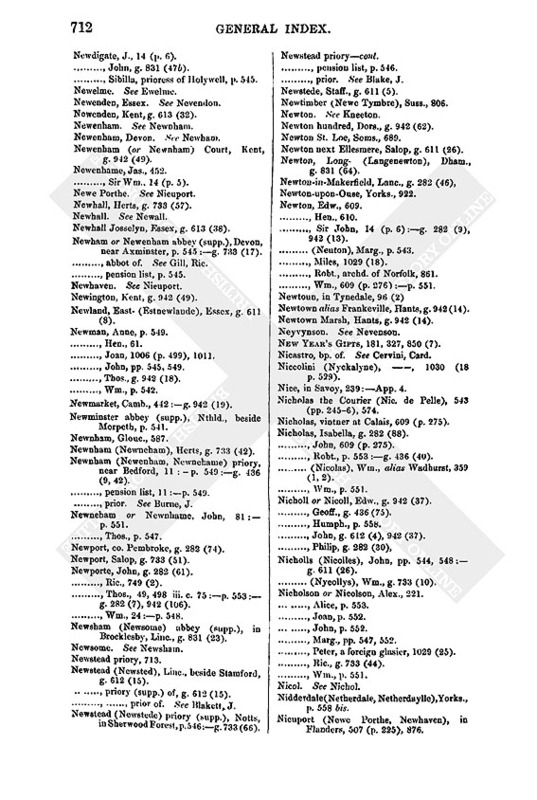 Newtown alias Frankeville, Hants, g. 942 (14). Newtown Marsh, Hants, g. 942 (14). New Year's Gifts, 181, 327, 850 (7). Nicastro, bp. of. See Cervini, Card. Niccolini (Nyckalyne), , 1030 (18 p. 529). Nice, in Savoy, 239:App. 4. Nicholas the Courier (Nic. de Pelle), 543 (pp. 2456), 574. Nicholas, vintner at Calais, 609 (p. 275). Nicholas, Isabella, g. 282 (88). -, John, 609 (p. 275). -, Robt., p. 553:g. 436 (40). -, (Nicolas), Wm., alias Wadhurst, 359 (1, 2). Nicholl or Nicoll, Edw., g. 942 (37). -, Geoff., g. 436 (75). -, John, g. 612 (4), 942 (37). Nicholls (Nicolles), John, pp. 544, 548:g. 611 (26). -, (Nycollys), Wm., g. 733 (10). Nicholson or Nicolson, Alex., 221. -, Marg., pp. 547, 552. -, Peter, a foreign glasier, 1029 (25). -, Ric., g. 733 (44). Nidderdale (Netherdale, Netherdaylle), Yorks., p. 558 bis. Nieuport (Newe Porthe, Newhaven), in Flanders, 507 (p. 225), 876. Nimeguen (Nymmeghe, Nymmege), in Gueldres, 309, 4823. -, letters dated at, 4823. Nimeguen (Novimagium), John of, letter from, 1029 (54). Noble (Nobyll), Eliz., g. 436 (25). Noke, Thos., g. 831 (60). Nokestuble wood, in Croydon, Surr., g. 613 (32). 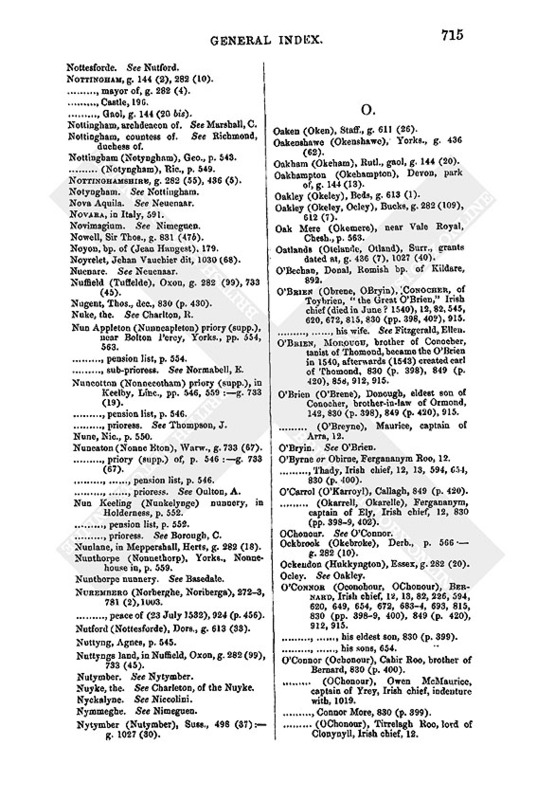 Non-residence, licences of, g. 144 (4), 282 (85), 611 (49), 733 (26). Nonsuch palace, in Cuddington-beside-Ewell, Surr., 498 (36). Norbury (Norbery), Surr., g. 144 (5), 942 (94). Norcott, near Abingdon, Berks, p. 563. Norfolk, 558:g. 282 (6), 1027 (41). -, feodary in, g. 144 (2). -, lands in, 69, 211, 393, 498 iii. c. 69. Norfolk, archdeacon of. See Newton, R.
Norfolk, Thomas Howard duke of (1514 to 1524), 498 iii. c. 73, 80. Norfolk, Thos. Howard duke of, Earl Marshal (envoy to France in Feb. 1540), 1, 14, 18, 22, 145, 202, 2079, 2224, 228, 2335, 23940, 253, 2578, 2701, 285, 289, 304, 320, 329, 334, 344, 370, 3889, 422, 429, 442, 493, 498 iii. c. 73, 76, 80, 500, 536, 543 (p. 244), 560 (1, 3), 588, 652, 697, 707 i., ii., 720 iv., 756, 767, 773, 7856, 792 ii., 794, 796, 804 (pp. 3778), 812, 8234, 837, 847, 849, 850 (1, 3), 860 (p. 430), 861 (2), 864, 876, 878, 886, 889, 901, 902 (pp. 4478), 910, 91416, 926, 932, 948, 859, 966, 970, 9867, 990, 1008, 101112, 1021, 1029 (8):p. 541:g. 282 (9, 1921, 335, 52, 61, 68, 96), 612 (14), 733 (63), 831 (34, 47 a, b), 942 (12, 13, 3941b, 434, 75), 1027 (7). -, -, letters from, 2224, 23940, 253, 329, 442. -, -, letters to, 233, 588, 773, 792 ii., 794, 796, 812, 837, 849, 864, 876, 878, 886, 889, 914, 932, 948, 1012. -, -, instructions for, 145. -, -, deposition of, 850 (3), 861 (2, 3). -, -, his French pension, 329. -, -, a servant of, at Bruges, 812. -, -, monastery given to, 370. Norfolk, Agnes duchess dowager of, stepmother of the Duke, 498 iii. cc. 73, 80. Norfolk, Elizabeth duchess of, wife of the Duke, daughter of Edward duke of Buckingham, living apart from her husband at Redbourne, 493, 498 (iii. cc. 76, 80), 1029 (8). -, -, letters from, 493, 1029 (8). Norgrove, Ric., 111 (2):p. 551. Normabell, Eleanor, sub-prioress of Nun Appleton, p. 554. Norman, Thos., alias Corton, abbot of Cerne, p. 542:g. 436 (67). Normandy, 58, 418 (p. 161), 429, 459, 472, 644, 709, 740, 749, 786, 817, 1022. -, Admiral's lieutenant in, 740. Normandy fen, Norf., g. 942 (18). Normanton, Notts, g. 733 (66), 831 (22). Normanton, Yorks., g. 282 (21). Normecote, Staff., g. 942 (42). Norres (Nores), , 1030 (18). -, (Noris), Anne, p. 547. -, Henry (executed 17 May 1536), 1029 (30). -, (Norreys), Joan, p. 547. -, (Nores), Sir John, 14 (p. 5). -, John, gentleman usher, letter from, 135. -, John, 393 (2), 806.p. 554. -, (Norreis), Ric., p. 552. -, (Nores), Thos., 1030 (18 p. 529). -, Commissioners for suppression of monasteries. See Henley, W.; Legh, Thos. ; Bellasis, R.; Watkins, J. -, -, brief report of, 139 (2). -, Council of the (Council at York), 25, 27, 85, 113, 11920, 131, 166 ii., 175, 191, 319, 3612, 428, 465, 502 (2), 633, 765n. -, -, letters from, 25, 85, 131, 319, 361, 428. -, -, letters to, 120, 175, 191. -, -, president of. See Holgate, R.
-, general pardon to, 428. -, re-edifying towns (Act), 498 (18). North, Clement, g. 733 (46). -, Edw., or Sir Edw., treasurer of Augmentations (17 March 1540), 474, 631, 653, 756, 771, 809 (p. 383), 980p. 558:g. 942 (61). -, -, letters from, 653, 771, 980. -, -, letter to, 756. -, -, signature of, 474. -, -, warrant for, 631. Northallerton (Northalverton), Yorks., St. James's hospital, 691, 726:g. 831 (64). -, -, master. See Morison, R.
-, -, surrender of, 691. Northam, Sems., near Bristol, g. 831 (21). Northampton, pp. 563, 565:g. 942 (99, 109). -, Austin Friars (supp.) of, g. 942 (99, 109). -, Castle, g. 144 (20). -, De la Pray (Delapre) nunnery (supp. ), pp. 5567, 563. -, Mervelles Mill, p. 565. -, Quengions Mills, p. 563. -, Rush Hall holme, g. 942 (99, 109). -, sanctuary at, 498 (12). -, St. Andrew's priory (supp.) 650 (3 ii.):p. 565:g. 942 (99, 109). -, St. James's abbey (supp. ), g. 436 (52), 611 (8 p. 285), 942 (99 p. 478, 109). Northampton, archdeacon of, 605. See Smith, G.
Northamptonshire, 605, 650, 1029 (37):g. 282 (55), 1027 (41). -, lands in, g. 612 (15). Northawe, Herts, g. 282 (108). Northbourn or Norborne, Kent, g. 613 (32). Northbroke, the Devonshire river, g. 436 (46). Northchurch, Herts, g. 831 (89). Northcot, near Reading, Berks, g. 436 (34). Northcote, Devon, g. 831 (28). Northcote, John, g. 282 (74). Northehope marsh, in Cliffe, Kent, g. 436 (61). Northern rebellion (of 15367), 280 (2), 405, 498 (59), 502 (2), 515, 830 (p. 398). North Hill, Cornw., 498 (34). North Lache, Glouc., g. 733 (65). Northmoston (Normeston), Devon, g. 282 (11). Northre, Kent, g. 613 (32). Northsture, Superior and Inferior, Kent, g. 613 (32). -, sheriff of (153940). See Ratcliff, Sir C.
Northumberland, archdeacon of. See Davell, R.
Northumberland, Henry Percy sixth earl of (152737), and his lands, p. 541. Northweald (Northwelde), Essex, g. 733 (68). Northweald Bassett (Northwelbasset), Essex, p. 540. Norton, Chesh., p. 556 bis. -, abbey (supp.) of, p. 556 bis. Norton, Derb., p. 562:g. 1027 (17). Norton, Norf., g. 942 (43 p. 471). Norton, Notts, g. 942 (70). Norton, Suff., g. 436 (31). Norton Brize (Brunesnorton), Oxon, 498 iii. c. 73:g. 942 (43). Norton, Cold-, Essex, g. 282 (89). Norton Dawney, Devon, g. 942 (58). Norton or King's Norton, Worc., g. 144 (2 p. 52). Norton next Malton, Yorks., g. 831 (73). Norton Parva, Derb., g. 1027 (17). Norton, Geo., g. 942 (92). -, John, 118, 884:pp. 541, 550:g. 282 (5, 21, 27, 77), 612 (14), 831 (47a), 942 (41b). -, Sampson, 609 (p. 275), 1031 (2). -, Thos., g. 733 (42). Norwich, g. 144 (2), 831 (72), 1027 (35). -, letters dated at, 506, 525. -, mayor of, g. 282 (6). -, Black Friars (supp.) of, g. 831 (72). -, Castle, 755:g. 144 (20). -, Cathedral, dean of. See Salisbury, J. -, St. Clement and St. Mary Incombusta, g. 831 (72). -, St. Giles Hospital, letter from master and fellows, 506. -, -, master. See Codde, R.
Norwich, bpric. of, g. 436 (59), 942 (84). -, -, Act touching, 498 (41). -, archdeacon of. See Wyndham, G.
-, bp. of. 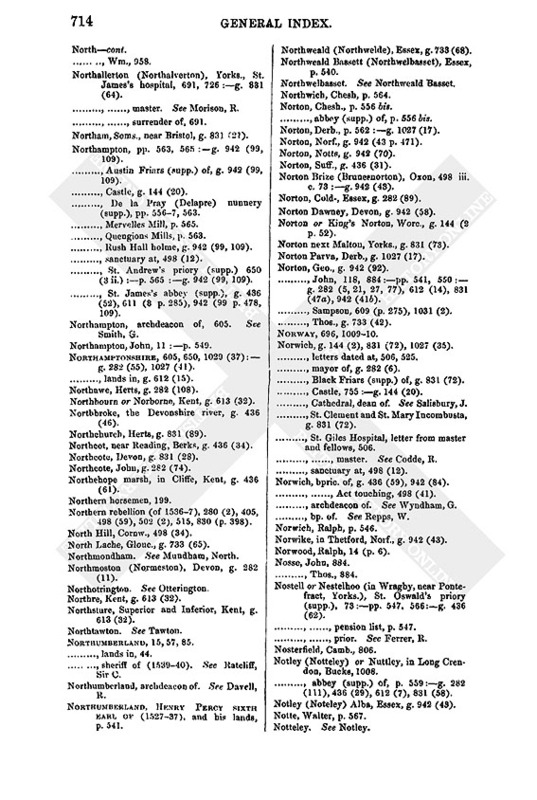 See Repps, W.
Norwike, in Thetford, Norf., g. 942 (43). Norwood, Ralph, 14 (p. 6). Nostell or Nestelhoo (in Wragby, near Pontefract, Yorks. ), St. Oswald's priory (supp. ), 73:pp. 547, 566:g. 436 (62). -, -, pension list, p. 547. -, -, prior. See Ferrer, R.
Notley (Notteley) or Nuttley, in Long Crendon, Bucks, 1008. -, abbey (supp.) of, p. 559:g. 282 (111), 436 (29), 612 (7), 831 (58). Notley (Noteley) Alba, Essex, g. 942 (43). Nottingham, g. 144 (2), 282 (10). -, mayor of, g. 282 (4). -, Gaol, g. 144(20 bis). Nottingham, archdeacon of. See Marshall, C.
Nottingham, countess of. See Richmond, duchess of. Nottingham (Notyngham), Geo., p. 543. -, (Notyngham), Ric., p. 549. Nottinghamshire, g. 282 (55), 436 (5). Nowell, Sir Thos., g. 831 (476). Noyon, bp. of (Jean Hangest), 179. Noyrelet, Jehan Vauchier dit, 1030 (68). Nuffield (Tuffelde), Oxon, g. 282 (99), 733 (45). Nugent, Thos., dec., 830 (p. 430). Nuke, the. See Charlton, R.
Nun Appleton (Nunneapleton) priory (supp. ), near Bolton Percy, Yorks., pp. 554, 563. -, pension list, p. 554. -, sub-prioress. See Normabell, E.
Nuncotton (Nonnecotham) priory (supp. ), in Keelby, Linc., pp. 546, 559:g. 733 (19). -, prioress. See Thompson, J.
Nuneaton (Nonne Eton), Warw., g. 733 (67). -, priory (supp.) of, p. 546:g. 733 (67). -, -, pension list, p. 546. -, -, prioress. See Oulton, A.
Nun Keeling (Nunkelynge) nunnery, in Holderness, p. 552. -, prioress. See Borough, C.
Nunlane, in Meppershall, Herts, g. 282 (18). Nunthorpe (Nonnethorp), Yorks., Nonnehouse in, p. 559. Nuremberg (Norberghe, Noriberga), 2723, 781 (2), 1003. -, peace of (23 July 1532), 924 (p. 456). Nutford (Nottesforde), Dors., g. 613 (33). Nuttyngs land, in Nuffield, Oxon, g. 282 (99), 733 (45). Nuyke, the. See Charleton, of the Nuyke. Nytymber (Nutymber), Suss., 498 (37):g. 1027 (30).